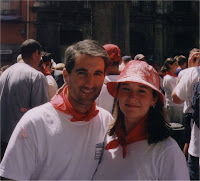 Satcha and I had just moved to Spain on July 2, 2002 and since neither of us was working at that time, we decided to go to San Fermin – the festival of the running of the bulls. We went to Chupinazo, the first day of this festival: On July 6, people gather in the town hall square where a rocket is set off at 12 o'clock to start the festival. By tradition no one is allowed to put on their red scarf until the rocket goes off, so while they are waiting they’re facing town hall holding the red scarf over their head in both hands. When the rocket is set off, everyone takes their red scarf and ties it around their neck, while singing "Pamploneses Viva San Fermin, Gora San Fermin" (citizens of Pamplona long live San Fermin). It's also a tradition to uncork bottles of Cava and spray it all around along with flour, eggs, mustard, ketchup, etc. Then the party is started, people party and dance in the streets and have a great time!!!! The next morning we got up at 5am to go see the Encierro, the running of the bulls, which starts at 8am. But, when we got to the barricaded area where we thought we would be able to see them, there were already a lot of people waiting. There were even people who climbed up on top of the light posts to see them. So, we ended up not being able to see the running. Ivan got us 2 tickets so that we could be in the bull ring where the running ends, the runners and bulls end up in the ring. When the bulls arrive in the ring they are led into their pens. When all the bulls are in their pens, small bulls with wrapped horns are released into the ring to "play" with the runners who stayed. The rules are that the people aren't supposed to touch the small bulls, but some of them do. They start grabbing at the bulls horns and try to drag them to the ground. This is when the crowd starts yelling "Hijo de puta!! (son of a *****!!)". It can get very hot during the San Fermin festival so many times people gather in groups in front of blocks of houses and yell for people to throw buckets of water on them. People will bring out buckets and even hoses of water to spray on the people in the street asking for this. We had a great time at San Fermin!!! !